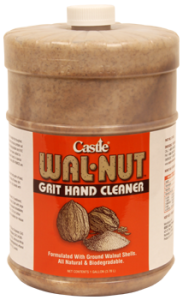 Castle® Wal•Nut™ Grit Hand Cleaner is formulated to handle the toughest dirt, grease, and ink using ground walnut shells as an alternative to pumice. 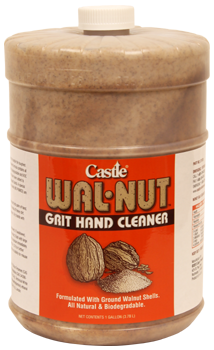 The blend of all natural ingredients is VOC compliant and completely biodegradable. Mild skin conditioners have been added to protect against chapped and cracked skin. 1. Dispense a small amount into palm of hand. 2. Rub together briskly, especially in areas of heavy dirt. 4. Dry hands with paper towel or cloth.